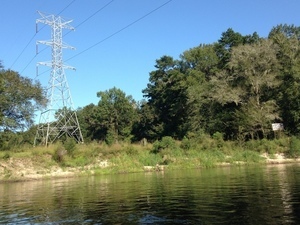 A 50-year-old Southern Natural Gas (SONAT) pipeline, reputed to be 24″ in diameter, goes under the Suwannee River at , 30.3917808, -83.1682968, less than 2000 feet upstream from the Withlacoochee Confluence. Here are pictures from 15 Aug 2015. Note the infestation of invasive exotic Chamber bitter, Phyllanthus urinaria, quite likely brought in on pipeline company equipment. That’s slightly downstream from where Sabal Trail currently wants to drill under the Suwannee River. Follow this link for where that SONAT pipeline goes. This is the same SONAT that has repeatedly complained to FERC about excessive crossings of its existing pipeline proposed by Sabal Trail. Kinder Morgan wants to expand the Florida Gas Transmission (FGT) pipeline east from Suwannee County to Jacksonville. There’s a schematic of that expansion and other maps in Where in Suwannee County is the KMI JAX Expansion Project? As noted in that KMI JEP schematic, the existing FGT pipeline is actually several pipes of several sizes (mostly 24″, 30″, 36″), with offshoots of still different sizes (16″, 8″, 4″, 3″): That schematic and those maps indicate that there’s an FGT spur that crosses the Suwannee south of the Duke Suwannee power plant. This appears to be it, as observed on a WWALS outing 21 September 2014, at 30.366052, -83.192082. 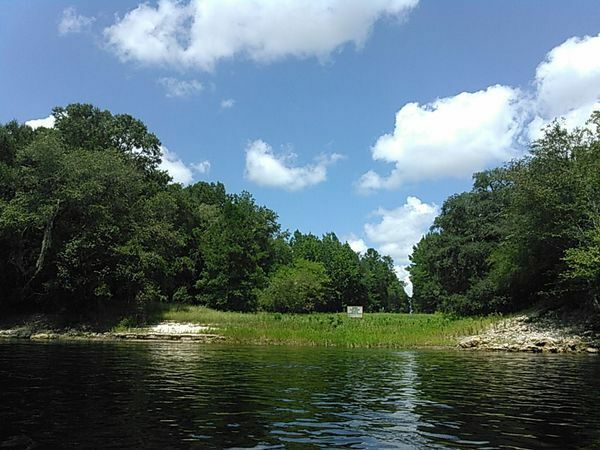 The FGT main line, which appears to be 36″ in diameter, crosses the Suwannee farther south, west of O’Brien, at 30.072490, -83.070364. That FGT main line continues east into Columbia County, and where it crosses that county line is where KMI’s Jacksonville Expansion Project (JEP) wants to add a 36″ loop, starting about 30.030804, -82.848685 between CR 49 and FL 247. The point marked is also where Sabal Trail’s proposed pipeline would intersect; how convenient for Sabal Trail fracked methane to get to Jacksonville, where JAXport is gearing up for liquid natural gas (LNG) export! An FGT offshoot, which according to the JEP schematic is 24″, heads due south and crosses the Santa Fe River, apparently about 1000 feet east (upstream) of US 129, here: 29.913973, -82.851609. Sabal Trail currently wants to cross into Gilchrist County slightly east (upstream) from there. The precise pipeline diameters and the locations of these river crossings are rather hard to find in filings at the Federal Energy Regulatory Commission (FERC) or in the Pipeline Mapper provided by the Pipeline & Hazardous Materials Safety Agency (PHMSA), or even in the Florida Public Service Commission (FL-PSC) records. National security, don’t you know! Even though WWALS wasn’t permitted to talk about it in WWALS v Sabal Trail & FDEP, pipelines are soft targets with inadequate security measures. See for example the fireball a mere 4″ FGT spur made in Bell, Florida in 2012 when a tree fell on it. Or FGT’s 2009 explosion between the Florida Turnpike and I-95, flying a 104-foot piece of 18-inch pipe through the air, shutting down both roads, and fortunately missing a high school. The National Transportation Safety Board (NTSB) determined FGT was at fault for not detecting corrosion before the pipeline blew up. Such lack of pipeline safety is yet another reason not to build any more of them. But the river crossings and much of the pipelines routes are not hard to find on google maps, because a 40-foot or wider pipeline right of way through forests and fields is pretty visible from space. So, PHMSA, FERC, NSA, etc., I haven’t revealed anything that wasn’t already public record. And maybe this information will be useful to those on the ground who have to live with these pipelines.